The Aspide Supercomfort is a new version of one of the most iconic recent additions to the Selle San Marco range. The hole has been reshaped to make it bigger and increase the relief zone for perineum pressure. 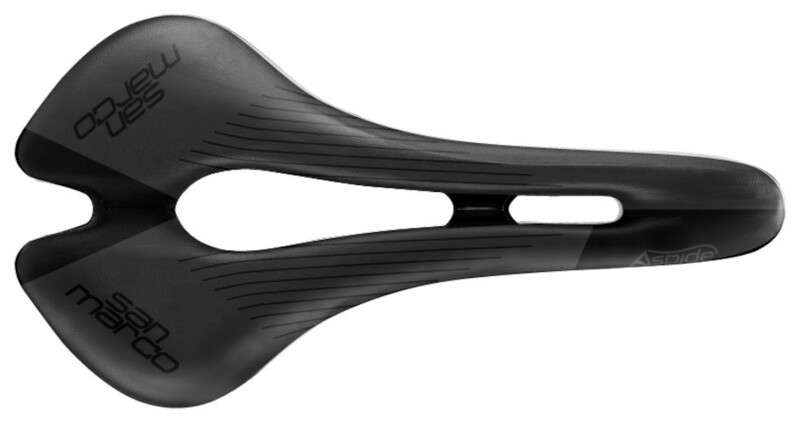 The level of variable density padding has been increased too; the Racing Saddle features a gel layer for maximum comfort. Comfortable women's saddle with extra padding and an anatomically correct pressure relief cut-out. Designed based on research into the shape of the female pelvis these saddles are supremely comfortable. A classic 90's saddle shape reimagined with advanced construction technqiues and high tech materials. Thanks to the unique combination of low weight, great comfort and the ultimate style, this saddle might be just perfect for you! The worlds first titanium lightweight railed saddle, and you know what? it's still pretty much unbeatable today. Sure you can buy lighter, but you can't get more comfortable.